The definitive compendium of the country’s cuisine, The Turkish Cookbook, published by Phaidon, brings together over 500 delicious tastes of Turkey, including dips, stews, salads and mouth-watering sweets. 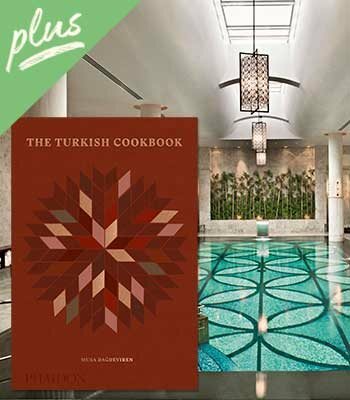 Exclusively for Plus members, our free to enter prize draw could see you sampling the best in Turkish cooking for yourself, in a weekend stay for you and a friend at the Four Seasons Hotel at the Bosprous. With dinner for two at chef Musa Dagdeviren’s exclusive restaurant, Ciya, included, as well as a tour of the city’s foodie hot-spots designed by the chef himself, it’s the perfect way to see Istanbul in style. These terms and conditions apply to the prize draw entitled The Turkish Cookbook Plus Prize Draw. Any validated Waterstones Plus customer who completes the online entry form and submits it before midnight on 30 April 2019 will be automatically entered into the prize draw. Only one prize per entrant is allowed notwithstanding multiple or second or subsequent entry forms. The ‘Entrant’ is the person completing the online entry form. Entrants must be aged 18 or over. Entrants must be residents of Great Britain and must provide a valid British address upon entry. This prize draw is not open to employees or contractors of the Promoter or the Publisher, their immediate families, nor to any other person connected with the pre-order draw. The Promoter reserves the right to amend the specification of the prize or offer an alternative prize of equivalent status. No cash alternative will be offered. The Prize is non-transferable. Unsuccessful entrants will not be contacted. The decision of the Promoter on all matters is final. A random draw of all valid entries will take place within six working days after the closing date above to select the winner(s). The winner(s) will be notified by telephone or email, and MUST respond by midnight within three days of the date of contact, providing a valid GB address for the prize to be dispatched to. If a selected winner does not meet all of the entry conditions or refuses the prize, another entrant will be selected at random from the remaining eligible entries within a reasonable timeframe. By being entered into the draw, entrants consent to the use of their names, city of residence, photograph and/or image for publicity purposes in all media carried out by the Promoter (and in the case of there being more than one, each of them) without payment or compensation. The Promoter may terminate, amend or withdraw this draw and/or these terms and conditions at any time. Entry to the prize draw is conditional on acceptance of these terms and conditions, which are governed exclusively by English Law and under the exclusive jurisdiction of the English courts. By entering this prize draw you are deemed to have read and accepted these terms. Promoter(s): Waterstones Booksellers Limited (“Waterstones”) (company number: 00610095) whose registered office address is at 203-206 Piccadilly, London, W1J 9HD.